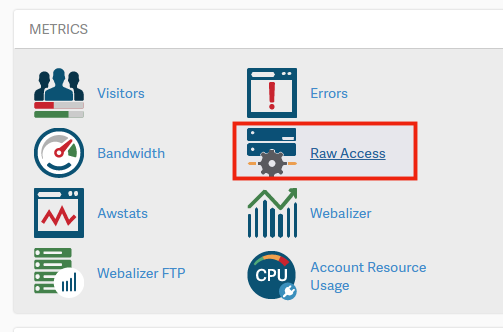 In cPanel you can access your website's raw access logs to see the traffic to your website, before it is turned into a report by statistics software. This is great for taking a closer look at the type of requests your site is getting. To get the most out of your raw access logs, you would want to enable raw access log archiving in cPanel. If you just wanted to easily review your website traffic you could use something like AWStats in cPanel to do so. If you have SSH access to your server, you can also learn about reviewing traffic from an Apache access log. Is there away to SSH in on command line and download the raw log files? The logs are in an area you would not have access to using SSH. Great, but we have to log into cPanel to do this. I analyze my logs programatically, every day, to look for security issues, user activity, etc. Until some months ago this was easy because the raw log file for the day resided in a user-accessible folder that could be pulled by FTP. Now it's spirited away in some place that tech support don't know about or won't talk about, so manual cPanel is the only method available. Unless I'm willing to download the entire month's compressed log to pick out one day's records. Sorry to be blunt but this is a step backwards. I've closed one hosting account due to this, and may do the same with another. I apologize for the inconvenience. The ability to FTP into the /access-logs directory does appear to be missing for the main cPanel users due to security restrictions on the server. However you should be able to use the userna5_logs FTP user which should have the same password as your main FTP account, and has direct access into your website's raw access logs. Obviously, replace userna5_ with your own cPanel username. Please let us know if you're still unable to access your raw access logs this way. Awesome! Glad that did the trick for you, thanks for commenting back and letting us know it worked. I'll go ahead and mark this guide as needing to be updated to also reflect that as an option for getting to your raw access logs. Let us know if you run into any further problems, we are constantly updating our content to try to provide the best solutions for any issues!